LETHBRIDGE, AB - The Lethbridge Bulls have announced the signing of returning player, Ben Erwin out of Niagara Univeristy. Looking to be a huge part of the Bulls success this year, Erwin returns for his third season having played in the summers of 2017 and 2018, sporting a 4.78 ERA and 46 strikeouts in 52.2 total innings. "It's exciting to have Ben back on the staff for 2019. When healthy, Ben is one of the top arms in the league. I love how he attacks the strike zone with his fastball and can keep hitters off balance with a plus change-up," said Bulls Head Coach, Jesse Sawyer. "Ben is a character guy and with 2019 being his third season with the Bulls organization, I am excited for him to take on a larger leadership role on the pitching staff," Sawyer added. The 2014 Baseball Alberta Bantam AAA Player of the year currently plays NCAA Division I baseball with the Niagara University Purple Eagles. 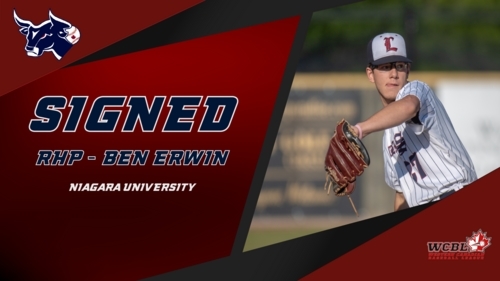 In his freshman year with the club, Erwin had a strong showing, posting a 4.39 ERA, 31 strikeouts, and finishing with a record of 5-2, in 55.1 innings pitched. The Bulls season kicks off May 25th in Edmonton as they take on the Prospects for a two game set, before heading home to face the Fort McMurray Giants in the VisitLethbridge.com Home Opener May 30th.